Fully integrated buffer tank and boiler. Provides seamless integration with Arctic Heat Pump to provide a full system backup solution and buffer in one tank. 4 ports with digital hydronic controller. Optional larger copper heat exchanger for on demand domestic hot water or can be used as a supplement with solar thermal heating. Complete with 15 year tank warranty. 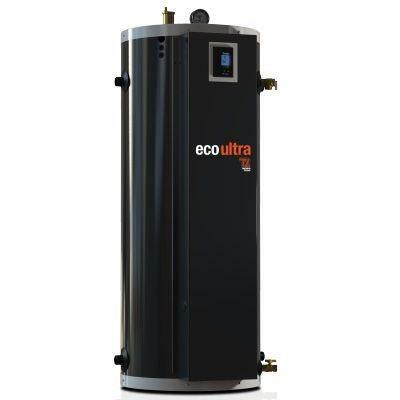 eco ULTRA50 48 US Gallons 280 lbs. 30 PSI 1" male NPT 22" 56 7/16"
eco ULTRA70 71 US Gallons 380 lbs. 30 PSI 1 1/4" male NPT 24" 66 5/16"
Electrical supply: 120/240V or 120/208V single-phase (L1 – N – L2) with three 90°C conductors, or two conductors L1 – L2 if the boiler does not require power to a 120 VAC pump or accessories. Multiply by .75 for a 208 VAC power supply. Multiply by .867 for a 208 VAC power supply. The wire guages and breaker capacity must be in conformity with the standards of the National Electrical Code (NEC), Canadian Electrical Code (CEC) and local codes (if applicable). *Not available with the eco ULTRA 50.